A must have for beginning and serious mechanics alike. Easily removes bushings and bearings from wheels, engine cases, etc. Will remove bushings and bearings with inner diameters measuring between 8mm and 30mm. Made from durable hardened steel. 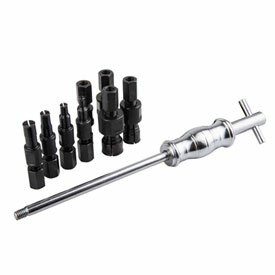 Kit includes slide hammer and 8 collets (8, 10, 12, 15, 17, 20, 25, 30mm)that attach to bearings, and a plastic case. Used these to remove wheel bearings. Made the job quick and effortless. High quality slide hammer and collets. Picked up this bearing remover to do the wheel bearings on all 3 of my bikes. It ripped out all the bearings easily and made the job painless. Gone are of the days of pry bars and a hammer. I also like the fact that the kit includes a ton of different size peices to remove just about any normal size bearing. For the price, the kit can't be beat! Great value and a must have to make removing blind bearings much easier. If you do not have one of these then what are you waiting for? This is possibly the best tool I ever bought to work on my bearings. One of the bearing broke a part and I had no idea what to do next. Then I saw this blind bearing puller and figured this may work. Yep worked amazingly! Pulled the broken bearing out no problem and then I used to pull the rest of the bearing on the bike. LOVE IT! Not sure if the chrome plating will hold up but not really concerned about it’s looks. Needed a bearing puller for wheel bearings on my sons bike. This tool made it simple easy. This is a must have if you are gonna be rebuilding motors. I had a blind bearing to remove on my honda crf250r and this tool made it a breeze! Well built set, came in very handy on a recent build.Well worth the price , even if you use it a couple of times. So far so good. The only thing so far is the black oxide coating coming off a bit, thus 4 stars for durability. Definitely worth the money not to have to try to hammer, chisel or otherwise hack bearing out. A little heat and my wheel bearings came right out. Great piece of tool. Works excellent. Have used this on many motorcycles and many atv's. It is a must have for every tool chest. Buy one quit using your buddies. Fast shipping as always from RMATV/MC. The BEST Purchase (if only they made this years ago)! The BEST tool for doing bottom end on engines, heat the case around the bearing (then using this tool they come out easily). I used this tool for the Small 8MM ID (on the extractor) to remove the Clutch Need Bearing. Without this tool, one can damage the Engine case. this is the first time I have purchased a puller for this type of job, wish I had invested in it years ago. Makes life much easier. Works as advertised. Should have bought it years ago. I had to rebuild my Grandson's Yamaha rear hub and knew I'd have trouble with the bearings. The Tusk bearing remover popped them out like it was made to. Don't get your skin between the slide hammer and the impact washer! one of the first set of bearings shelled out and before I could make it back to fix it my Stepson and Grandson tried to get the inner race out with a punch and hammer to no avail. I walked in, got out the bearing remover and had it out in a jiffy. Good product! I’m so used to being able to remove wheel bearings with a drift and hammer, I thought nothing of it when needed to replace the front and rear wheel bearings of my 08 Honda CRF450X. I was sorely mistaken! Tried my best, just no way to get it done without this blind bearing tool! It took me literally seconds with this quality Tusk tool.......thank you rmatv! Highly recommend!! Made bearing removal quick and easy. Good, but a little modification and it worked perfectly. The modification wasn’t necessary, but a little extra helps. This little gem worked flawlessly on removing blind bearings on my 250r when I rebuilt the motor. High quality tool. What a breeze to use, makes wheel bearing removal so easy. The tusk bearing puller worked great. Did exactly what I needed it to do, and is real high quality. I couldn't be happier. If you work on your own bike ,you need this.Good product at a fair price. Borrowed this kit from a buddy while rebuilding the lower end on a KTM 200. 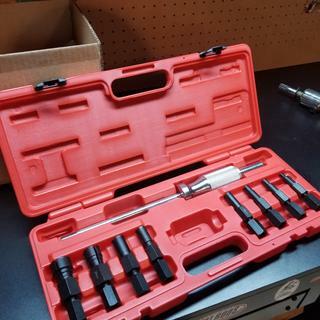 INSTANT Tool Envy, ordered my own kit that night. Good kit, I'd recommend it to anyone who does their own maintenance. Bought this to use for replacing rear wheel bearings and made the job easy and painless. Makes quick work of blind bearings! Great too to assist in removing bearings. Took me 30 minutes to pull bearings out of a wheel by hand, and took 2 minutes with this tool! Best tool and price u need to have this in you garage. Tusk bearing puller , have not had time to use as only just received but this tool makes bearing removal a breeze . Must have tool, makes bearing removal quick and easy. This puller made the job of removing blind bearings from a YZ125 case easy. One of the cheapest motorcycle bearing pullers around and seems very high quality! So far so good. The puller fits the wheel bearings on my dr650, xt350, and tt350. It is fairly easy to get into the bearings and once tightened it pulls even old nasty seized looking bearings out no problem. It also looks like it will be fairly durable, each puller feels heavy and durable like any good tool should. I could never accurately set low tire pressures till I got this gauge. It's a must have for MX. Man these work great! Had to replace all the bearing in our bikes and glad I had these. Very pleased with this product and would definitely use this again and recommend to others. This bearing puller is very useful for many different sizes of bearings. I used this on my YZ250 rear wheel bearings and it made a job very easy and fast. I would say about this is make sure you wear some type of gloves while using it. After screwing my bearings up, trying to get them out without the proper tool. I broke down and bought this. few min. later I was finished with the wheel. This is a high quality product in a nice case. You always worry when you buy the cheaper tools but this was a pleasant surprise. Tool worked sufficient well to remove wheel bearings. Slide hammer would work better if there was a t-handle located at top to hold on to better. Manufacturer provides no information with tool for use or ordering additional collets. What if I were to break or lose one, Would I have to purchase a another complete kit? I thought the additional price I paid for this tool would have provided me with better manufacturer support down the road! I would shop around!!! TECH NOTE: REPLACEMENT COLLETS ARE AVAILABLE TO PURCHASE. Well worth the chunk of change. Tool paid for itself the first time I used it, pulling two bearings went from 30 minutes to 30 seconds of work. Wish I bought this a long time ago. Far better quality and cheaper than the HF set. Great product. Worked excellent on my wheel bearings. Would definitely recommend getting this if you don't mind doing the work. Got this to remove the pilot clutch lifter bearings in my cr 250. Was hard to get it to compress and get into the bearing. Once I got the first one out It was just barely long enough to get the one in the back. You have to make sure you use the size that just barely fits into the bearing. The next one down will slip out and damage the lip. Used a small hose clamp to help compress it and then tapped it in with a hammer. Glad I bought it. Would like to see them longer though. Removes all kinds of bearings and sizes without the hammer and punch. Knocks out bearings evenly and protects interior from marring the walls from punches or similar tools. Good tool for the price no need to spend more for the same tool. Can you use this on swing arm bearings ? BEST ANSWER: I tied to use this to pull out bearings from my KDX 220 swingarm and all it did was rip the side race from the bearing. Be careful! It might have worked if the bearings had not been frozen in place because the prior Owner had never changed them !!! I think you probably can. It works great on bushings and bearing as long as the adapters will reach in far enough to grab the inside edge. I just used Motion Pro swing arm kit to take bearings out and then install them . It was really easy with the right tools. THey make a separate tool for swingarm bearings, I use sockets and a vise. Is this like a blind bearing ouller? BEST ANSWER: Yes but with my experience with this it’s made from pretty soft metal. It worked for pulling my bearings out of the case but only expect this to last 1 maybe 2 engine builds. Pulling Edges rounded pretty fast. that is exactly what it is. very simple, wish I thought it out. The only safe way to remove bearings in wheels. Yes, select the proper size ID collet, snug it up, and slap hammer the bearing out. Works great for me . Yes. It expands inside the bearing and you use the slide hammer to remove it. It is. It worked very well. Is this the same as a blind bearing remover? BEST ANSWER: Yes, this will pull a bearing from a blind hole ( a hole which doesn't go all the way through the material). Blind bearings are named such because you cannot look all the way through the hole, nor can you push the bearing out the back side. Will this work for my linkage and swing arm bearings??? This tool is more suited for removing blind bushings and bearings. It will probably remove linkage and swingarm bearings depending on inside diameters. Tusk makes a bearing remover and installer specifically for linkage and swingarm. Good price point and does the job well. I've USED MINE TO DO WHEEL BEARINGS ON MY 2014 xcw AND IT WORKED GREAT. not KNOWING THE DIA OF YOUR BEARINGS IT IS HARD TO SAY? the PRODUCT DESCRIPTION SHOULD GIVE YOU THE ANSWER YOU NEED ON WHAT SIZES IT'LL HANDLE. patience AND PROPER USAGE IS KEY. It should work for most of the bearings, just need to make sure that one of the adapters will fit that specific bearing. I used mine for my wheel bearings and it worked perfectly. Can you buy replacement collets for this set? How long is the slide hammer? BEST ANSWER: Total length is 15.5", working slide length for the hammer to slide on is 12"
15 1/2 inches overall length. Very happy with bearing puller tool set. Thanks I ordered on rebuilding bottom end on RM125. Thanks for the reply - goin to order the tool. Can ye deliver to Ireland?? BEST ANSWER: Yes, we do deliver to Ireland. Please email sales@rockymountainatv.com with a list of part numbers you'd like to order and your full shipping address and they will be able to reply with a shipping quote for you. Does Tusk make a 6mm collet to pull the small inner water pump bearing? BEST ANSWER: The smallest size Tusk offers is 8 mm. I have used the Tusk bearing removal kit for Years with No problems. However since purchasing a Tusk Wheel set, there is no collett to fit these bearings. Please help out there seems to be a Size missing, but I have all the sets calls and comes with? BEST ANSWER: you can call in and tell us what sizes you have and we can see if there is a size missing from your kit. it is possible. It is not missing any sizes, this I know But there definitely is not a size to fit the Tusk bearings that are needed for the Tusk Impact wheel set, No one else has ever commented on this problem? Will this work for an LTR 450 and Yamaha blaster? BEST ANSWER: Yep! It will work with any bearing that requires a bearing remover.